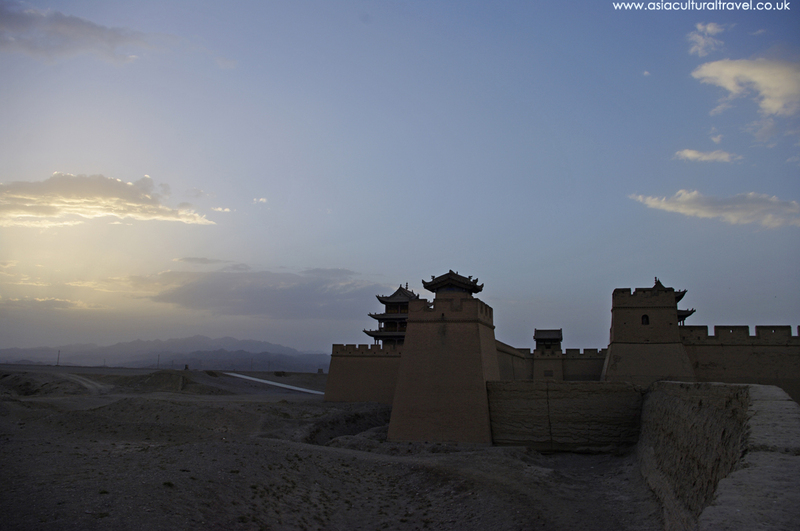 Heralded as the “First and Greatest Pass under Heaven”, Jiayu Pass was once one of the most important military fortresses along the Great Wall, alongside Juyong Pass near Beijing and Shanhai Pass in Hebei province. Its grand nickname derives from the fact that it is the first pass at the western end of the Great Wall and, for hundreds of years, it was widely regarded as impregnable. Resting 6 kilometres (4 mi) from the city of Jiayuguan, it spans the narrowest point within the western section of the Hexi Corridor and sits at the base of Jiayu Mountain, from which its name originates. 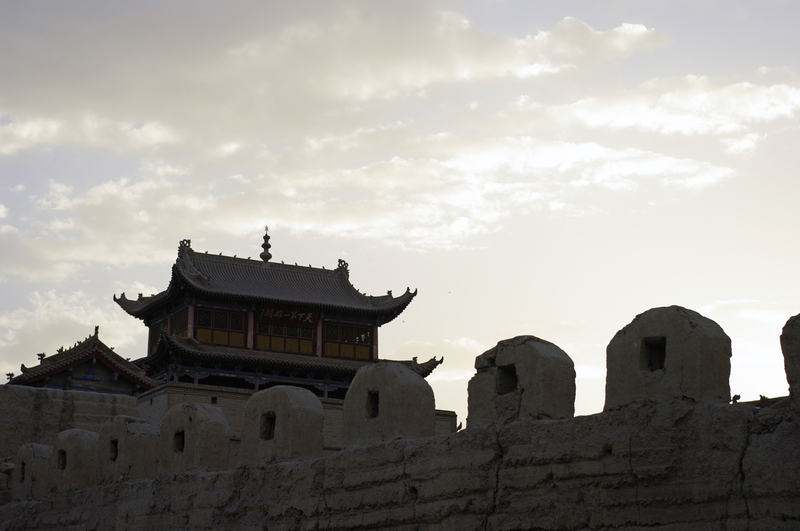 Its focal location near China’s westernmost edge means it was once a key waypoint along the ancient Silk Road. According to a delightful legend, when the pass was being planned, the official charged with its construction approached the designer and asked him to estimate the number of bricks they would need. The designer emphatically replied that they needed exactly 99,999 bricks but the official flew into a rage, believing the designer to be overconfident in his abilities. He demanded that the designer compensate for any potential oversights by ordering more bricks and, as an act of defiance, the designer ordered just one extra brick. In the end, he was right and the one lone brick, left over after the pass’ completion, reputedly still rests on top of one of the gates. Unfortunately, the truth is rarely as exciting as the rumour! Jiayu Pass was originally built in 1372, during the Ming Dynasty (1368-1644), under the supervision of an official named Feng Sheng. Unlike other sections of the Great Wall, which were constructed from grey bricks, this section of the wall was made from loess soil that was tamped together in layers, giving it a markedly yellowish hue. However, this section continued to be enhanced and renovated right up until 1540, meaning its construction technically lasted for over 160 years! Altogether the pass is made up of two gates and three defensive sections: the inner city, the outer city, and a moat. The inner city is enclosed within an 11-metre (36 ft.) high wall and is accessible via two gates, one in the east and one in the west. In keeping with the fortified nature of the complex, each of these gates is protected by a small guard tower and a barbican. Outside the inner city, the outer city forms a secondary barrier and served as the major defensive point of the pass. Its western wall was built from bricks, making it particularly solid, and it incorporates a three-storey tower with a plaque that reads: “Tian Xia Di Yi Xiong Guan” (天下第一雄关) or “the First and Greatest Pass under Heaven”. In short, its towering achievements are undeniable! Within the inner city, a number of historic structures have been well-preserved, including the Youji General’s Office and Wenchang Hall. In ancient times, the Youji General’s Office was where generals stationed at the pass would gather to discuss military affairs and plan out strategies. The meeting hall reproduces the scene of various generals pouring over military matters, and the back yard offers an insight into how the generals’ families may have lived. While the Youji General’s Office was a place of tactical violence, Wenchang Hall served as the birthplace of beauty and tranquillity. This scenic two-storey pavilion, with its intricately latticed doors and windows, was once used by literati to meet, paint, read, and compose poetry during the Qing Dynasty (1644-1912). Over time, it became the workplace of government officials. Outside the inner city, the Temple of Guan Yu was the place where generals and soldiers stationed at the pass would pay homage to the legendary Guan Yu, a supposedly invincible military figure from the Shu-Han Dynasty (221-263 AD). The nearby Opera Tower offered soldiers, residents, and passing merchants with a much needed dose of relaxation in the form of magnificent operas. Its red pillars, elaborately carved beams, and exquisite murals of the Eight Immortals continue to delight visitors to this day. At the eastern gate, a giant white beacon tower marks the Jiayuguan Great Wall Museum, where visitors can marvel at ancient weapons, view paintings of the Great Wall, and learn all about the architectural history of Jiayu Pass. Approximately 8 kilometres (5 mi) south of the pass lies what is known as the “First Strategic Post under Heaven”. Its proximity to the Taolai River earned it the nickname the Taolai River Pier or the First Pier, although strictly speaking it is actually a beacon tower. It was originally built by an official named Li Han in 1539 and represented the western starting point of the Ming Dynasty Great Wall. Beacons towers such as this one were used as a sort of alarm system along the Great Wall and, as the first beacon tower to the west, its significance as a defensive structure was immeasurable. Tragically all that remains of this once magnificent structure is a lonely earthen mound resting at the edge of a cliff. 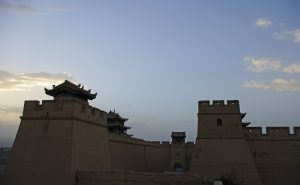 Historically Jiayu Pass was renowned for its defensive capabilities and its importance to the Silk Road, but it also garnered a rather fearsome reputation as the place where those who were exiled or disgraced were ordered to leave. Known by many as the Gate of Demons, it was believed that any man or woman banished from this gate and left to wander the unforgiving Gobi Desert would certainly never return. The long archway leading out of Jiayu Pass, nicknamed the Traveller’s Gate, was also known as the Gate of Sighs, as it represented the last point before one entered the desert wastes. Etched into its walls are countless writings, penned by exiles, dishonoured officials, and criminals who contemplated their impending demise as they woefully marched out of their beloved country and into the unknown.